If the freezer compartment in your refrigerator reminds you of an icy Arctic wasteland, it may be time to defrost. Newer models often have a built-in defrost mechanism that keeps ice from building up on the interior walls, but some models require a manual defrost. Expect the entire process to take a few hours to complete. Rather than having a set defrosting schedule, the best indicator is a quick peek inside the freezer. If the ice is one-fourth-inch thick or more, it's time for a defrost. The ideal time to defrost is before the ice gets more than half an inch thick. 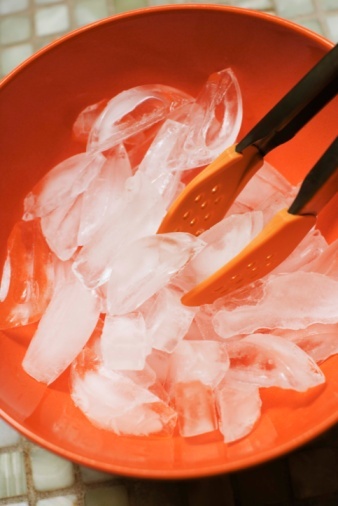 If the ice gets thicker, it can force your freezer to work harder than necessary and use more energy. Plus, the defrosting process takes longer the thicker the ice gets. The length of time between defrosting depends on your specific fridge. A rough estimate is once per year, but your refrigerator may build up ice faster or slower. Adjust your defrost timing accordingly based on the thickness of the ice. You don't want your perishable goods to defrost with your refrigerator, so it's time to move it all out. 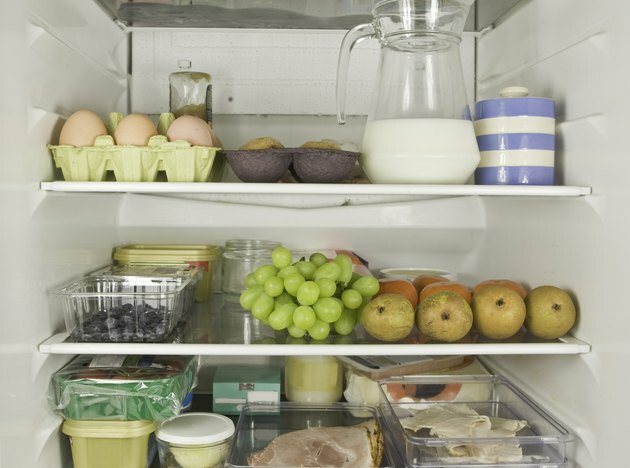 If you have a separate freezer or another refrigerator, move the food there temporarily. If not, the food should be fine in a cooler until you're done defrosting. Add ice to the cooler to help keep the food cold. Remember to remove perishable items from the refrigerator portion, too, since you'll be turning off the entire unit. Turn off and unplug the refrigerator to speed up the process and avoid wasting energy. Place some old towels inside the freezer to soak up the water from the melting ice. It's also a good idea to put towels down on the floor in case the water drips out of the fridge. Manual defrosting can take a few hours to complete. Leave the doors of both the freezer and refrigerator section open to let warm air inside for faster melting. You can also place a bowl of hot water inside the freezer to help speed up thawing. You'll need to reheat the water every 15 minutes or so to keep it hot. As the ice starts to melt, you can help the process along by using a plastic scraper to remove frost from the walls. Avoid anything sharp, pointed or metal, which can scratch or puncture the interior. Periodically check the towels to see if they need to be replaced. Once all the ice is gone, you can turn your refrigerator back on and get everything running again. Clean the interior of the refrigerator and the gaskets along the door while you have the unit empty. Dry all surfaces before you put the food back inside. Then plug the fridge back in, turn it on and set the temperature dials appropriately. Simple maintenance tasks such as defrosting your refrigerator regularly help your appliances run efficiently. It can also help extend the life of the unit. A few hours of defrosting keeps your refrigerator in shape and ready to keep all of your perishables frozen and safe. Shelley Frost combines her love of DIY and writing in her freelance career. She has first-hand experience with tiling, painting, refinishing hardwood floors, installing lighting, roofing and many other home improvement projects. She keeps her DIY skills fresh with regular projects around the house and extensive writing work on the topic. What Causes the Freezer to Smell?